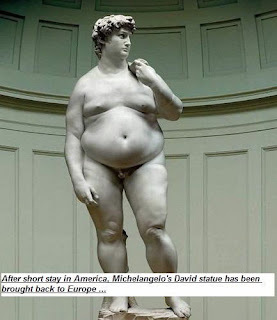 Friday - elliptical, 30-45 min/ Greek chicken with "everything orzo"
Loved the statue....you are so funny! I wish I knew how to do pics on blogs one eighth as much as you do!! The booze, the pizza, the fries, ugh. I totally blame Europe. How is it that Americans are the fat ones? I totally blame my extra weight on schnitzel and schnapps.